"Raise the Dead: Live at Wacken "
There's just no stopping Uncle Alice. While it's already been four years since his last studio recording, the highly entertaining sequel album "Welcome 2 My Nightmare", Alice Cooper is enjoying a revival in comic book form with a new series through Dynamite Comics. He also has another live package to promote, his 2013 appearance at the metal mecca, Wacken Open Air, titled "Raise the Dead: Live at Wacken". Performing as a sextet with a triple guitar attack featuring Ryan Roxie, Tommy Hendrickson and a femme fatale known as Orianthi (of late replaced by the IRON MAIDENS' Nita Strauss), Alice's touring ensemble for this set is rounded by drummer Glen Sobel and the Beasto Blanco himself, Chuck Garric, on bass. As Roxie and Garric have been with Alice for quite some time now, they ringlead the stage in their own subtle fashions while never stealing the show from their host. Thus the band you see here is mostly a well-calibrated machine. Performing for a rabid audience who might've easily settled for a set comprised of only "Flush the Fashion", "Zipper Catches Skin" and "DaDa" if Alice Cooper threatened them, "Raise the Dead"'s set is largely a catering job of Cooper favorites and his pop rock hits from the late Eighties. 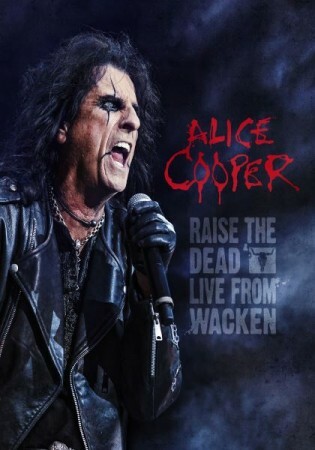 Add a serving of covers designed to homage Alice's late Boomer peers, "Raise the Dead: Live at Wacken" is not quite the prime cut show one would hope for, albeit "Department of Youth" from the original "Welcome to My Nightmare" checks in along with "Hello Hooray" from "Billion Dollar Babies" and the amped-up title track from the "Dirty Diamonds" album. A good portion of this set consists of Alice Cooper's safe and sanitized hard rock numbers that boosted his 1980s resurgence. It would be awesome if Alice would grant a cut from his stellar (and third heaviest album behind "Dragontown" and "Brutal Planet") "Raise Your Fist and Yell" from the same period, or maybe a for-fun, long-ago track from "Muscle of Love", just to remind the world what a maverick the man was. However, Alice and his posse play to an audience heavily attended by Generation X with "House of Fire", "Poison", "Hey Stoopid" and "Feed My Frankenstein". The expected vintage year staples make their appearances as well, including "No More Mr. Nice Guy", "Under My Wheels", "Billion Dollar Babies", "Welcome to My Nightmare" (albeit an abbreviated version), "I'm Eighteen" and, of course, the curtain call closer, "School's Out". Two numbers from "Welcome 2 My Nightmare" make it into set, "Caffeine" and "I'll Bite Your Face Off" and of course, the superb, trusty trifecta "Ballad of Dwight Fry", "Killer" and "I Love the Dead" make their mandatory run. Thank God for that, because largely, this set rolls along with bare minimum fanfare and flash. Alice whirls fake money from his sword during "Billion Dollar Babies" and he totes an oversized coffee mug around the stage during "Caffeine". He still swings a mighty whip during "Go to Hell" and the Iron Eddie-esque Frankencooper makes its massive, goofy appearance during "Feed My Frankenstein". Otherwise, Alice and the band opt to let the skewered dolls and plastic ghoul heads around the stage serve as the theatricality for most of the ride, aside from some facial blood smears upon the band, plus Alice's oversized top hats, skeletal exposure jacket and gore-strewn smock. Frankly, one begins to worry if the guillotine is going to make it into the set since there's no Jason mask, only a butchered "ki ki ki ma ma ma" from Alice during "He's Back (The Man Behind the Mask", and "Welcome to My Nightmare" is pushed out and cut off more as an obligation than a compulsory part of the show. However, Uncle Alice delivers the goods as soon as "Ballad of Dwight Fry" begins. If you've never seen the insane asylum skit that begins in a straitjacket and ends with the famous decapitation, turn in your rocker's card, but don't worry, it's all here for you. As Alice and the band rip through THE DOORS' "Break On Through" and THE WHO's "My Generation", one can understand Alice's need to connect with these rock classics since he began his career at the height of these songs' popularity. Still, for a set packed with too much of the "Trash" and "Hey Stoopid" AOR fare, the covers (including Alice's bleeding of PINK FLOYD's "Another Brick in the Wall" into his own "School's Out") are unnecessary and dare one say, unwanted. A pick from his terrific "Along Came a Spider" album would've been better, or the smarmy anti-ballad "Something to Remember Me By" from "Welcome 2 My Nightmare". Or perhaps "I Am the Future", Alice's theme song from the "Class of 1984" movie, just to part the fans from the mere revelers. Or for a ridiculous but way-fun blindside from the past, "Swing Low, Sweet Cheerio" from "Pretties for You". Of course, that's the problem from a reviewer's standpoint, a hoity-toity gnawing inside to tinker with a man's successful formula to his or her own whims. That being said, "Raise the Dead: Live at Wacken" is a pretty good romp with a largely tight band featuring Alice Cooper in an outdoor festival setting. By the time the Wacken steer's head has flamed-on during the final laps of Cooper's show, that's all you need to smile at the whole thing.